This collection of guess books and accessories are perfect for your ceremony. Many of them can be personalized. These autograph mats are a great inexpensive option to guest books. They are so inexpensive you can purchase several. Each includes silver or gold pen, matching the inner mat color. 11" x 14" mat holds 5" x 7" photograph or wedding invitation. Wide margin can be decorated or autographed. Price is per mat. These are not personalized. These embroidered chair sashes are perfect for the new couple. Let guests know where you are sitting with embroidered chair sashes trimmed with grosgrain ribbon and embroidered as shown, with "Mr." and "Mrs." and your last name in your choice of thread color. Sashes are 4" wide and 106" long. Please specify last name and thread color. Please allow 5-7 extra working days. Sashes will ship separately from the rest of the order. Price is for the set of 2 embroidered chair sashes. Please add your last names in the comment field below. Guest book platter can create a unique keepsake for your next special occasion. This oval guest book platter is perfect for weddings, anniversaries, birthdays, or any special celebration! Using the permanent black pen that is designed to write on porcelain finishes; guests can sign their names and thoughts to create a one of a kind gift. 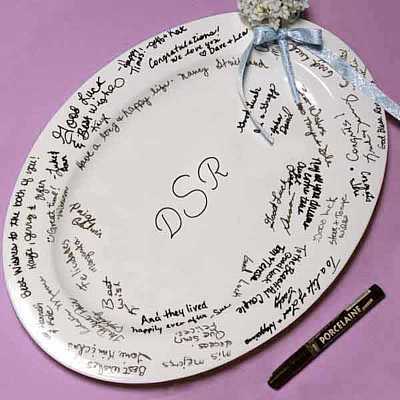 Guest book platters are commercial grade white porcelain and include a black pen with detailed instructions. Platter is available in 13 3/4" and 18". 13 3/4" fits 75-100 signatures and 18" platter fits up to 200-250 signatures. A guest book signature frame is a great way to celebrate your special day with the thoughtful words of your guests surrounded by your favorite wedding picture. A 5� x 7� photograph is centered in this 18 �� x 22 �� black wood veneer frame with white photo mat and glass cover. We recommend using an acid-free fine point scrap-booking pen (not included). 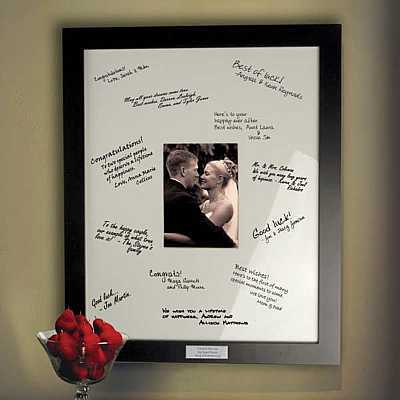 The guestbook signature frame is perfect for weddings and anniversaries. 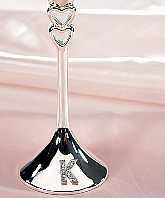 The Silver-plated plate is engraved with: I found the one my heart loves Song of Solomon 3:4 or personalized with your names and date. Please enter your first names and date in the comment field below if you want the frame personalized. All engraved items may take up to 8 business days to ship. Don�t forget to write� What a great gift to give to bridesmaids or to use with your ceremony guest book. 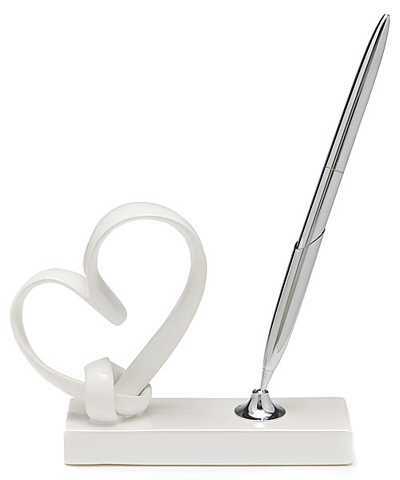 She'll love corresponding with her pen pals using this special keepsake pen with a heart-shaped base. As an added value, may be personalized with a single initial at no additional charge. Measures 8 1/4" x 2 1/4". Silver-plated. Due to high volume, all engraved items will take 8 business days to ship. Put your initial in the comment field below. Each pillow will be embroidered with a single-initial monogram. Choose lavender, pink, light blue, navy or claret to accent your pillow. Each pillow features matching satin streamers as shown. Each pillow also features a satin ribbon on the 8" x 8" pillow for easy carrying. Please allow 5-7 additional working days; your personalized pillow will ship separately from the rest of your order. Add a personal touch to the top of your wedding cake with lightweight, silver-tone letter cake tops. An ampersand (&) is also available for use when ordering more than one letter. Cake tops stand approximately 5" tall, measure approximately 6 1/2" across and are 1" deep. Price is per letter cake topper. 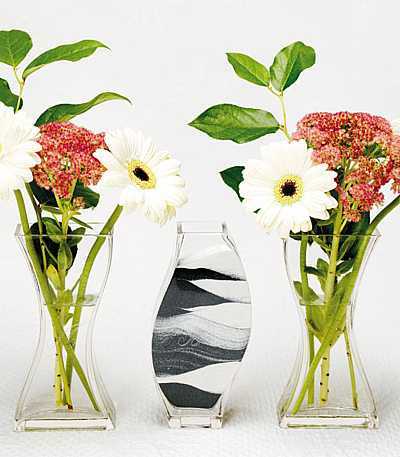 1) The Groom will commence by pouring a portion of the black sand into the central glass vase. 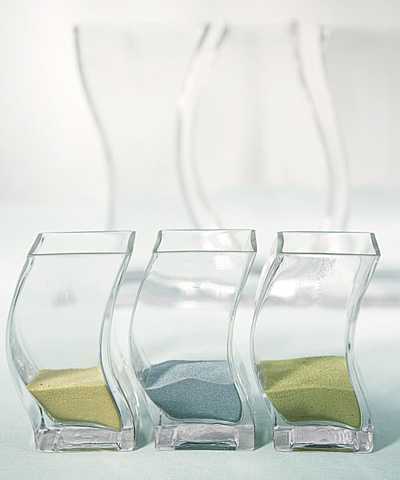 2)The Bride will follow by pouring a portion of the white sand also into the central vase creating a layered effect. 3)To complete the ceremony, the Groom and Bride simultaneously pour the balance of their sand into the central container. Following the wedding, the two outside vases can be used to display fresh flowers while the central vase will remain a cherished keepsake of your wedding day. These customized window clings can be used on any window surface. 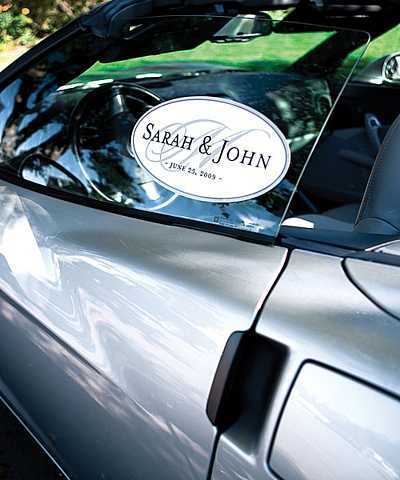 They are a great way to personalize your get-away car in a sophisticated manner. Great for on the church doors or at the reception location to help direct your guests. Price is per personalized window cling. There are two different sizes to choose from: Small 12" x 6" or Large 18" x 9" Please add your personalization in the comment section below: Names, Date, Initial. Monogrammed guest book platters create a unique keepsake for your next special occasion. This oval monogrammed guest book platter is perfect for weddings, anniversaries, birthdays, or any special celebration! Using the permanent black pen that is designed to write on porcelain finishes; guests can sign their names and thoughts to create a one of a kind gift. As an added value, may be personalized with a monogram. The monogram will be engraved in black ink. 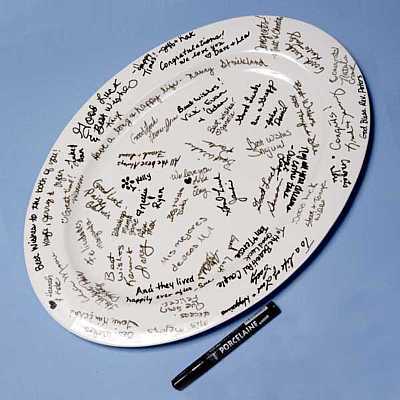 Platters are commercial grade white porcelain and include a black pen with detailed instructions. All personalized items may take up to 8 days to ship. Enter your monogram in the comment field below. Put your monogram in the order that you want it to appear on the platter. Please don't give us your names etc. Just the letters in the order that you want us to print it. The 2nd letter will be larger than the 1st and 3rd. 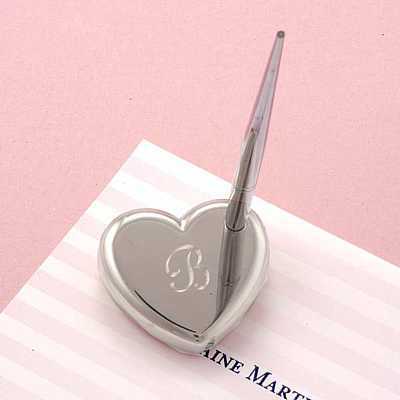 This stylized heart pen set will be a romantic addition to any wedding d�cor as well as a beautiful keepsake for the years that follow. Made of glazed ceramic. 6"H Price is per pen set. What a great unique idea. This 6" diameter, pewter ring features the verse shown and makes a contemporary alternative to the ring bearer pillow or flower girl basket. A chiffon ribbon adds to the endearing message. Price is per neverending ring bearer circle. Perfect Pair Wish Jar The perfect pair jar is a unique alternative to the traditional guest book. 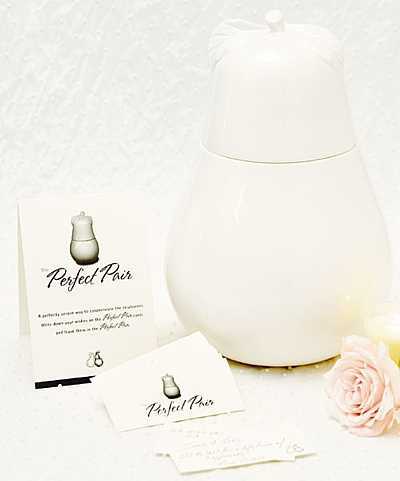 The Perfect Pair tent card asks guests to write down their wishes on individual Perfect Pair cards and place them in the jar. After you've stored those wishes away, the Perfect Pair makes a great cookie jar! ( Wish cards and Perfect Pair Jar sold separately ) Coordinating Perfect Pair Favor Containers and satin ribbon imprinted with Perfect Pair are also available. Plan to combine all of these decorative components to complete your Perfect Pair theme. Price is for the perfect pair jar only. Antique White Ceramic 8" x 12"H If you want to add a wish card kit (tent card with instructions and 50 wish cards), it is $8.50. You can also purchase more wish cards without the tent card separately. This personalized white aisle runner is printed with your first names, last name and last name initial in your choice of ink color. Please specify first names, last name, last name initial and ink color. The runner is made of sturdy plastic and measures 36" x 100'. Please allow two additional weeks. Aisle runner will ship separately from the rest of your order. Price is per personalized aisle runner. Please put your personalization in the comment field below. These beautiful personalized special occasion albums are exciting and versatile. They are perfect for any special occasion, from weddings to birthdays to holidays. 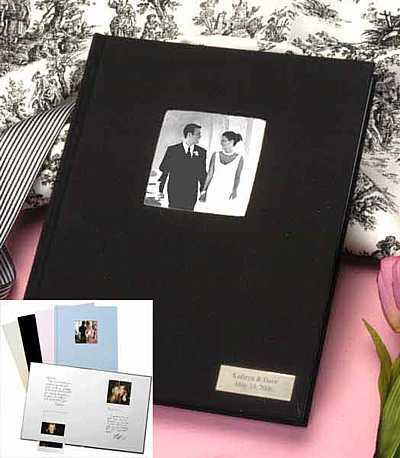 Our personalized embroidered albums come in a variety of sizes to choose from. There are 12 different colors of thread to choose from for the embroidery. Embroidery can be up to 20 characters, 2 line maximum. The embroidery size windows are as follows: 12" x 12" embroidered album is 5"w x 4"h, 8" x 8" embroidered album is 5"h x 3"w, 4" x 6 embroidered album is 3"h x 3.5"w.
Scrapbook Album - post bound - comes complete with 20 12" x 12" top loading pages. Post Bound Album - 8" x 8" come with 20 top loading pages. 2-up 4" x 6" - Side loading with Memo lines for each photo. Book holds up to 80 photos. Prices are different for each embroidered album. Scrapbook: $75 each, Post Bound Album: $65 each, Photo: $30 All prices include personalization. Up to 10 business days for personalization. Please put your personalization in the comment field below. If you are choosing a monogram as your personalization, please put "monogram: and the 3 initials in the order that you want them embroidered. For example: monogram: PAE The middle letter will be larger than outside letters for the monogram. Personalized guestbook platter can create a unique keepsake for your next special occasion. This oval personalized guestbook platter is perfect for weddings, anniversaries, birthdays, or any special celebration! Using the permanent black pen that is designed to write on porcelain finishes; guests can sign their names and thoughts to create a one of a kind gift. For a uniquely personal look, a ring of sparkling rhinestones gathers a colorful satin band embroidered with a two-initial monogram on the guest book and your names on the pillow as shown. The 7 1/2" x 5 3/4", white satin guest book holds 600 signatures. Please allow an additional 5-7 working days; your personalized guest book and pillow will ship separately from the rest of your order. Price is per personalized ribbon guest book or personalized ribbon pillow. Please add your personalization in the comment section below. For the guest book: 2 initials. For the pillow: first names. This silver signature frame is a treasured keepsake that offers a great contemporary frame in a matte silver finish. This fabulous silver keepsake frame may be used by the bride and groom as a guest book alternative, or for any occasion to commemorate a milestone celebration like a birthday, graduation, or anniversary. 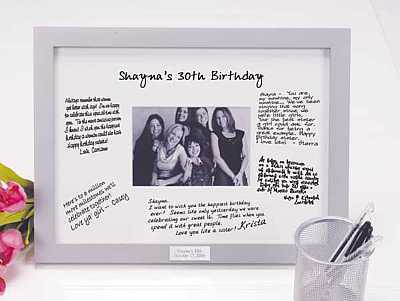 White photo mat accommodates a 4" X 6" photograph and the names and thoughts of your loved ones. We recommend using an acid-free scrap booking pen for best results (not included). Frame may be personalized with a custom silver plate engraved with up to two lines of engraving with 17 characters per line. Your dog is your best friend, your companion, your "Best Pet!". 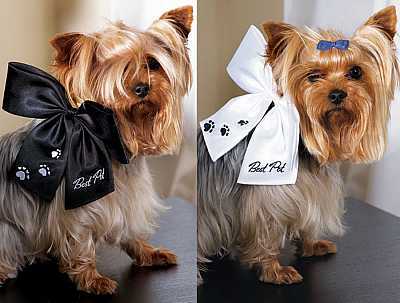 Show them off at the ceremony with this charming wedding dog bow, designed to attach to your existing collar. Available in black or white. Price is per wedding dog bow. Allow guests to proclaim "Wedding Wishes" in the guest book while you snap a quick memory. Add individual pictures within the book to keep track of those helping celebrate the Wedding Day. "Wedding Wishes, a day remembered" is printed with silver lettering on the white cover as a black satin ribbon binds the book together. The book holds 50 pictures with a size of 3 3/4" x 4 3/8". Holds Polaroid pictures. If you would like is personalized with a silver plate, please enter your personalization in the comment box below. 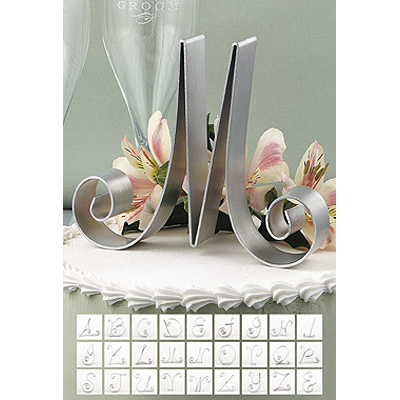 You may personalize with first names and date (2 lines of personalization) or 3 letter monogram. If you are using a monogram, please enter the initials in the order that they are to be engraved. The middle initial is usually the last name initial, and it will be larger. Each guest will get to congratulate you and give you their best wishes for the upcoming years on these personalized white cards (sets of 50). Let guests place their cards inside this wish vase with your photo inserted inside a silver-tone ornament. Put your personalization in the comment field below. You can get the wish book personalized with first names and date (2 lines) or monogram. The wish cards are personalized with first names only. If you personalizing the book, please let us know the personalization for each. Prices are in the options drop down box. You purchase each item separately.